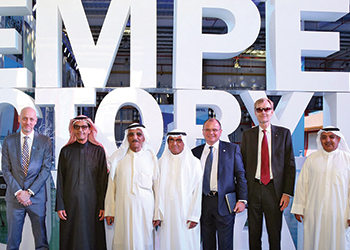 Officials at the official opening ceremony for Hempel’s new Kuwait factory. Hempel, a leading paint manufacturer, has inaugurated a new factory in Kuwait to meet increased demand and also to consolidate its position as market leader in the region. The new factory, costing $14.02 million, is set up in Mina Abdullah and meets ISO 9000 quality management guidelines. Hempel is the leading coatings supplier in Kuwait. Over the years, its coatings have been used to protect and decorate some of the country’s most iconic buildings, including the Kuwait Towers and the Kuwait Opera House, as well as numerous schools, mosques, hospitals, shopping malls and other important civil structures, it said. With a 40 per cent higher capacity than Hempel’s existing production facility in Safat, Kuwait, the new factory will help the company meet growing demand for its coatings in the country and the other GCC states. The new factory will be fully up and running by September, and Hempel’s existing factory in Safat will close later in the year. “We are looking forward to continuing to be the market leader in the region, while increasing production and making our operations cleaner, faster and more energy efficient,” he added. The factory includes a solvent distillation unit that recycles solvents to reduce hazardous waste, as well as a water treatment plant that ensures much of the factory’s wastewater can be reused for irrigation and cleaning. It is also the first coatings production unit in Kuwait to include a regenerative thermal oxidiser unit, which removes volatile organic compounds during production to prevent atmospheric pollution. The factory was opened at a ceremony attended by Ole Frijs-Madsen, Danish ambassador to Kuwait, senior Hempel executives and employees, media representatives and other guests. “This is a clear sign of our customers’ trust in the quality of our products, which have now become a benchmark for companies worldwide. Today, as we inaugurate this state-of-the art factory, we are also celebrating a story of enduring partnerships that have lasted over 51 years,” he added.